Champagne Rosé is a wine of charm, festive, with incomparable style, color, and flavor, often most appreciated by the gente feminine. Blend: made with 87.5% of Champagne Brut Tradition and 12.5% of red wine picked from the slopes of the Grande Montagne de Reims in Rilly la Montagne. 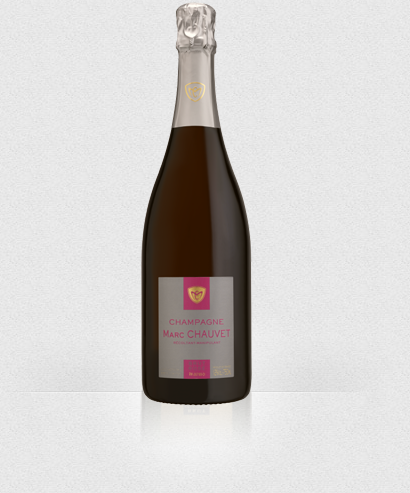 The red wine is obtained from the Pinot noir grape and is elaborated completely apart from the champagnes . Colour : voluntarily sustained, strong and joyful, beautiful raspberry colour . Nose : slightly acidic berries, currant and raspberry aromas. Mouth : party wine, fresh, harmonious, balanced, red fruit flavors. Food / Wine : the Cuvée Ruby accompanies magnificently white meats during a meal "totally champagne".